Most homeowners and renters have to pay electricity bills from their utility each month. In many states, electricity customers don’t even have a choice around which provider they use. Community solar offers an easy, sustainable way to take your electricity use into your own hands. With shared solar, you can choose to use the solar energy generated by a large solar array located in your community. As you start to think about investing in community shared solar, you’ll encounter new and unfamiliar terminology and policies. The best way to understand all of the terms and conditions that are included in your shared solar options is to comparison-shop in a community solar marketplace. When you explore your options through EnergySage’s Community Solar Marketplace™, you can ensure that you have all of the relevant information in front of you before making a purchase. At EnergySage, we encourage every homeowner or business considering shared solar to compare multiple offers, rather than working with a single shared solar provider. 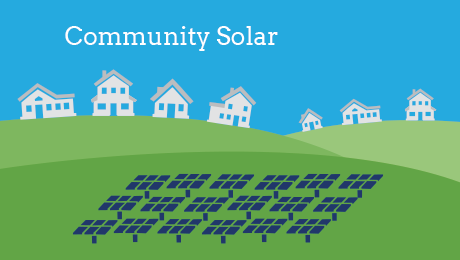 Our online platform will provide a list of community solar projects in your area. EnergySage recommends that you engage with 2 to 3 providers of roofless solar options in order to understand the trade-offs between each option and ensure that you maximize your return on solar investment. Take the time to review all of your community solar offers, and don’t be afraid to ask questions about the key differences between the proposals. One of the primary benefits of community solar is that you can contribute to a shared solar project in your area without installing panels on your roof. In most cases, you need to find a community solar project that is located in the same area as your electricity provider. (There are some exceptions to this requirement, such as Arcadia Power’s community solar offering.) The Community Solar Marketplace™ makes it easy to sort projects by state and find a provider that works with your utility. Community solar providers typically offer one of two community solar pricing models: ownership or subscription. If you choose to own your share of the solar garden, you buy the share in cash or take out a loan. Once you break even on your investment, you’ll receive free solar electricity for the duration of your solar panels’ lifespan. If you choose a community solar subscription, you pay a monthly fee for the output of a section of the solar garden. Comparing offers from multiple community solar providers with different contract types can help you understand the relative costs and benefits of each option. If you subscribe to a community solar garden, your savings will depend on the structure of your contract. Some contracts guarantee a set discount from your utility rates, either in cents per kilowatt-hour or as a percentage. Others will require you to pay a fixed rate, either per kilowatt-hour or per month. Some fixed rates will increase on an annual basis. Pricing will vary depending on the community solar provider you choose, the location of your project, and the size of your share. Many community solar developers have an “offer” that illustrates your projected month-to-month savings. While this information is typically only available by contacting the provider directly, the Community Solar Marketplace™ presents it up front. The length of a community solar agreement typically ranges from 10 to 25 years depending on your provider. You can lock in lower rates by selecting a contract with an extended contract term, or choose to sign up for a project offering a shorter term if you plan on moving in the near future. You may not be able to take your community solar share with you in the event that you move or sell your home. If you own your share, you will need to sell it if you move outside of your utility’s service territory. If you choose a subscription, some providers will charge a cancellation fee if you move before the end of your contract term. Others will simply require that you provide advanced notice, or that you transfer your share to a new customer. You can find this information in your provider’s community solar contract or on the Community Solar Marketplace™.